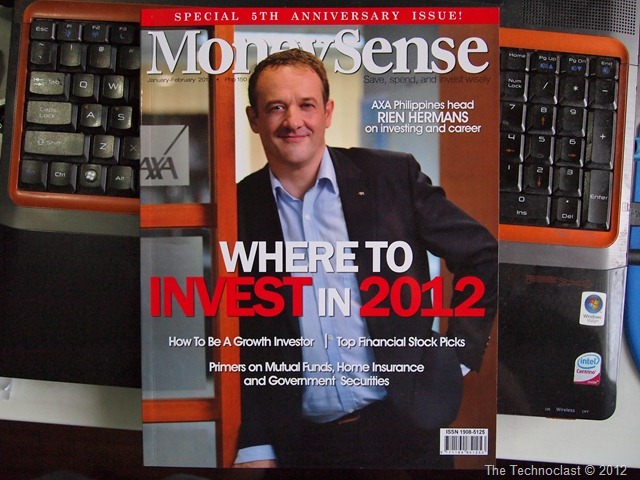 Grab A Copy Of MoneySense Jan-Feb 2012 Edition Today; Why? Because We’re In It! Back in early January I was tapped by a Co-Blogger, Ruth Manimtim-Floresca, to share a few tips on finding the right televisions for investment savvy consumers in the Philippine Market. Ruth, who maintains a few blogs of her own, is also a Contributing Author to large publications including The Manila Bulletin and MoneySense Magazine. 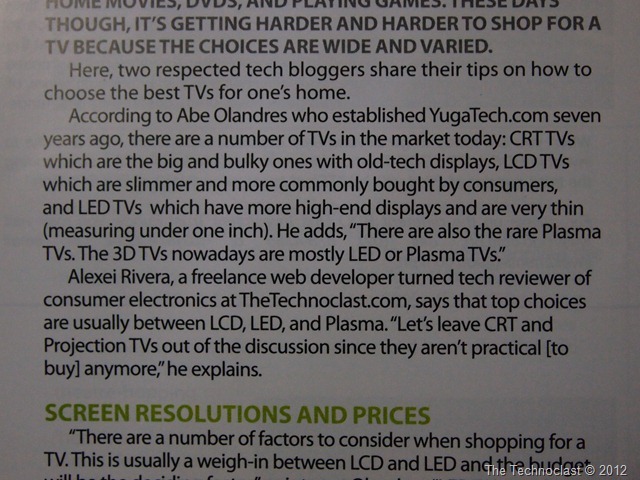 My advice on TVs would eventually end up on the January-February 2012 edition of the latter publication. Entitled “The Bottom Line: Buyer’s Guide For TV’s,” the article spans two pages and we share the glory with the famous tech blogger Mr. Abe Olandres of YugaTech fame. Merely having the chance to stand (figuratively) in the presence of these giants (Mr. Olandres and a huge publication like MoneySense) is definitely quite an honor, and we thank Ruth for giving us this opportunity. In the article we break down the choices of televisions to three main categories: LCD, LED & Plasma. Going in more detail, there’s tips there on how to choose the right size, type, resolution, and even durability. Specific information is also given on how to pick the right displays for your usage patterns – like the advantages and disadvantages of LED and plasma screens. Finally, there’s some tips there on which TV to purchase for specific purposes like for previous generations, motion-gaming, or even space saving advice. Ultimately though, we gloss on the importance of having good HD sources for video since HD televisions won’t really help without proper HD content to watch. Either way, to check it all out, you’ll have to grab a copy of MoneySense for Jan to Feb this year. Other bloggers & industry friends who were featured in the magazine include Jeman Villanueva of OrangeMagazineTV; Ruth Dela Cruz of Ruthilicious; Aileen Siwa of PinoyBeat; and Eric Losloso of Business Mirror. Again, huge thanks to Ruth Floresca for this great opportunity! Update: The full version of the article is now available for your viewing. So if you missed the magazine on the newsstands, just click here and you’ll be able to read the whole thing!